Stay informed with the latest news by email. So an awesome week, an historic week, and a lot of fun with a few very happy patients! Nkhoma now has a modern ‘phaco’ cataract surgery service! The first permanent such unit in Malawi. Fantastic. Although the technique we use for cataract surgery for thousands of operations each year is very very good, and we can perform an operation to treat blindness in 7-8 minutes; the availability of ‘phaco’ allows for a much smaller incision in the eye, and a faster visual recovery. Also less astigmatism (and need for glasses) and glare after surgery. Some of the really good artificial lenses we can use, have a built in UV filter to protect the retina from the sun! Which is nice. 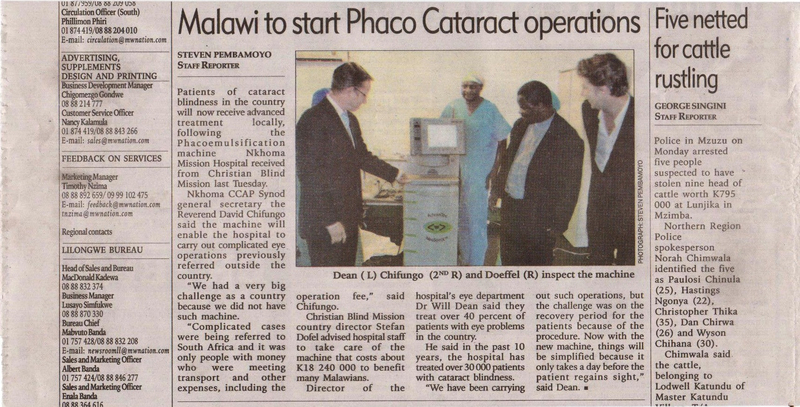 In the end, I am so happy to have had the chance to bring ‘phaco’ to rural Malawi. And the big thing is we will now have the chance to earn a little money for the hospital, in order to continue to go into more villages and screen people with blindness, which is great. It is thanks to CBM supporters that this initiative was even possible. After 18 months of planning, redrafting the plan, seeking advice(from the clinical and business side of things), getting the equipment and consumables together; we are here! Eesh, it was kind of a long haul, but very much worth it. We had a bit opening ceremony at Nkhoma last Tuesday with singing and dancing and drums and speeches. Very colourful and attracted a big crowd. I’ll keep you posted on how it develops. Congrats to Will and all the team in the Eye department at NKhoma.Keep up the good work.Nick and Mags. CBM is an international development organisation, committed to improving the quality of life of persons with disabilities in the poorest countries of the world. CBM UK is registered in England and Wales as charity number 1058162.